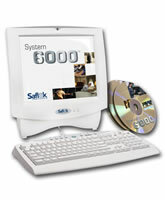 Only one solution provides the security of an access audit system, the ultimate in key management flexibility, and superior control throughout your property — SAFLOK's™ System 6000™. This Windows-based system is ready to interface with your existing property management system (PMS) and is completely customizable to best suit your property's specific needs. Delivering tomorrow's security solutions today, System 6000 is compatible with all current SAFLOK lock models, such as MT™, Confidant MT®, ädesē®, and the Quantum™ series.